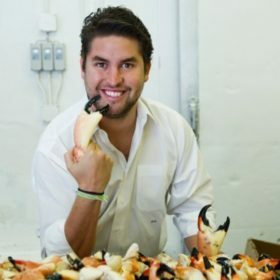 Entrepreneurs Roger Duarte and Sam Gorenstein are treating customers throughout the Miami area to a fresh take on fast-casual dining: fresh seafood in the form of ceviche. Ceviche, a dish popular in the coastal regions of Central and South America, is made from raw fish or shellfish marinated in citrus juices, spiced with chili peppers and accompanied by sweet potatoes, corn or avocados. Founded in 2012, My Ceviche currently delivers a tasty, fresh and affordable range of ceviches, salads, tacos, burritos and stone crabs in a fast casual environment. The company currently operates in two locations with six to eight more set to open – including one at the Miami International Airport. By focusing on sourcing the freshest ingredients, the restaurants ensures quality without sacrificing affordability. My Ceviche’s South Beach location repaid its investment within nine weeks, with demand outpacing the restaurant’s capacity in just three months. Roger and Sam’s two locations each generated US$1M in revenue and served over 137,500 customers in their second year alone. With their complementary backgrounds in restaurants and in business, Roger and Sam have turned their concept into a highly scalable business model. The two are both featured on Forbes’ “30 Under 30” list.